Omloop Het Niuwsblad, KBK and the Vuelta a Andalucia highlight a big week in Europe. Andrew Hood gives the run down. The 2009 Omloop Het Nieuwsblad peloton. There’s no shortage of racing across Europe this week. The Ruta del Sol continues in Spain and the Giro di Sardegna clicks into gear today in Italy, but the real action is this coming weekend in Belgium. Omloop Het Nieuwsblad and Kuurne-Brussels-Kuurne kick start the Belgian racing calendar and are the first major goals for many classics-bound riders. 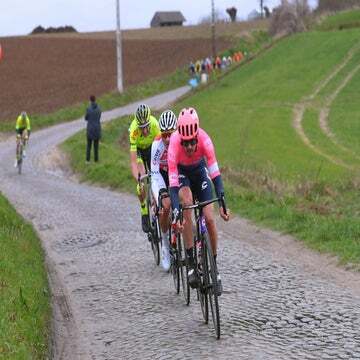 The two one-day races are prestigious in their own right, with many winners of such events as Tour of Flanders and Paris-Roubaix among the winners’ list. Racing also opens in Switzerland with the first races along the lake country around Lugano, so there’s plenty of action to follow throughout the week. The five-day Ruta opened Sunday in what’s typically sunny, southern Spain. But Europe’s horrendous winter is even reaching as far south as Andalucía, where heavy rainfall has caused devastating floods throughout the region. Going into Tuesday’s stage, Sergio Pardilla was holding the lead after his stage 1 victory, with Oscar Freire (Rabobank) snagging his second win of the year in stage 2. Mark Cavendish (HTC-Columbia) was fourth in Monday’s stage in what was his first sprint of the 2010 season. A heavy finish-line crash caused some damage in Monday’s finale, with the likes of Damiano Cunego (Lampre), Linus Gerdemann (Milram), Jelle Vanendert (Omega Pharma-Lotto) and Laurens Ten Dam (Rabobank) forced out of the race with injuries. Thursday’s 10.9km time trial at Málaga will be decisive in the overall ahead of Friday’s 161km hilly finale to Antequera. The five-day Sardinia tour opens Tuesday after teams took an overnight ferry to the spectacular Mediterranean island. Without a time trial, the race is typically decided on challenging hills and breakaway attempts on the small roads. The Italian-heavy peloton features the season debut of Liquigas riders Vicenzo Nibali and Roman Kreuziger while Chris Horner will be making his inaugural race in a RadioShack jersey. After more than a 10-year absence, Daniele Bennati won last year’s edition of the re-born race. Sunday’s Classica Sarda Olbia-Pantogia concludes a solid week of racing on one of Europe’s loveliest islands. For some, the “real” bike racing season starts with what used to be known as (and still will be) Omloop Het Volk. It’s the official opener of the Belgian racing calendar and the first semi-classic of the year. The 204km “loop” starts and ends in the thriving college town of Ghent and tackles several of the cobblestones and climbs featured in the Tour of Flanders, still more than a month away. The first section of cobbles comes at 75km at Haaghoek, and from there to the finish, there are a series of climbs that makes Het Nieuwsblad one of the most prestigious races to have on any self-respecting palmares. The route tackles such Flanders landmarks as Berendries and the Tenbosse as well as the Geraardsbergen, with its infamous steeps of nearly 20 percent. The last major climb at Molenberg is an ideal place to attack. Last year’s winner Thor Hushovd (Cervélo TestTeam) is trying to fend off a cold and might not start. Gert Steegmans (RadioShack) is questionable after a heavy fall at the Volta ao Algarve last weekend. Tom Boonen leads a strong QuickStep while former winner Nick Nuyens (Rabobank) is keen to prove he’s back at his best after struggling through last year’s classics season with a cold. Sky will bring a strong squad with Edvald Boasson Hagen and Juan Antonio Flecha while George Hincapie and Alessandro Ballan lead BMC. Weather can be a factor and forecasters are calling for 40 percent chance of rain, temperatures in the high 40s and strong winds out of the south. Sounds like perfect bike racing weather to a Belgian. A women’s version of the race precedes the men’s race in what’s a big day of Belgian racing. This is only the second year of the hilly race held in Switzerland’s stunning lake country. The first edition was won by Francesco Ginanni of the Androni-Giocattoli team. KBK complements Het Nieuwsblad and gives riders who came close the day before a chance to redeem themselves in the more sprint-friendly route. Quick Step has owned the race, winning the past four editions, with Tom Boonen taking two of the past three titles. George Hincapie won in 2005 in what’s one of his most important Belgian results. The start list is almost identical to Het Nieuwsblat, with some extra sprinters thrown into the mix who might have skipped racing Saturday to be fresher for Sunday’s battle. Tyler Farrar will lead Garmin-Transitions in a route that’s ideal for his characteristics. Forecasters are also calling for some nasty weather, with rain and strong winds up to 50kph out of the south. One of the most important, and last remaining, one-day races in Spain. Many of the top riders at the Ruta del Sol will stay in Andalucía to train ahead of the hilly course that typically comes down to a mass sprint. The 178km route features three rated climbs, including the Cat. 2 Alto de Lucainena at about 110km, nothing that the sprinters cannot manage. There’s always a threat of a breakaway pulling clear, but the sprint teams typically work together to set up their captains for a shot at victory. Greg Henderson (now Team Sky) won last year for HTC-Columbia while JJ Haedo won in 2008 for Saxo Bank. Other favorites include Mark Cavendish (HTC-Columbia), Koldo Fernández (Euskaltel-Euskadi) and Theo Bos (Cervélo). The second half of the Lugano weekend, the GP di Lugano used to be a time trial race, but switched over to become a road race in 1981. Remi Pauriol (Cofidis) won last year’s edition on a circuit course that features some challenging hills around the lakes.